When it is dinnertime at my house, it’s Ready-Set-Go! Everyone rushes down to the kitchen. Yes, even me — I need to see what kind of food my human is dishing up so I can shun it! As you can see, we all have very different speeds on our way to dinner. Can you guess the order in which we get fed? I’ll let you know which of you got it right on Monday. It’s my favorite thing in the whole world when the kitties rush to their food to just snub it. aarrrrgggghhhhh! Thank goodness there are starving kitties in the parking lot at work–I bring them lots of yummy food that my two goofs won’t eat. Does the rush for dinnertime every get old? I am thinking you, Sparkle, will be first so you have more shunning time. Then Boodie and Binga bringing up the tail. I’d guess the winner of the race gets served first. Wow! Sparkle, wes gets feeded every morning and every night and we can free feed all day on what we does not finish (and crunchies) AND we all shares the same dishes. Well, there is 4 dishes…1 with cat crunchies, 1 with kitten crunchies, and 2 with wet cat foods. If wes all wants to eats at the same time, Jo-Jo eats out of the kitten dishes and ME (Nellie) always goes first and Kozmo after. Me thinks it is Binga, Sparkle and Boodie! You better be the first one Sparkle! I notice everyone else says Binga, Boodie and then you so I’ll be different. Boodie, Binga, then you. If I participated in the Photo Hunt, I’d have a pic of me in my litterbox but since TW doesn’t haave any of those pics, I can’t GO. I think you get fed first because you eat more slowly, then Binga and Boodie last so you and Binga have chance to eat some before Boodie demolishes hers. Thanks so much for checking us Sparkle!! We’re good here, just hot and laying low. Binga, Boodie, Sparkle. I reckon though perhaps you Sparkle, being slim and fleeting get’s there first!! Hmmmm? We say YOU first Sparkle, so Staff can watch you, then Binga, to appease her, then Boodie! I would guess Binga, Sparkle, Boodie. Around here it is AbbyGoat first. Love those stairs! We guess that Binga gets food first, even though obviously it’s Boodie who gets there first! What a good sprint! Then, when you get there, probably you get fed last. We bet Binga and Boodie are first to keep them occupied and then you are served a specialty dish! Waffles and I race to the kitchen when Glogirly gets up in the morning. We’re usually neck and neck. But Glogirly knows what to do. She ALWAYS feeds me first. I love this photo! 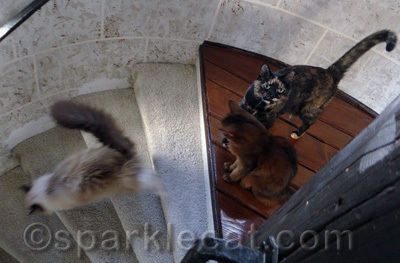 I never realized until “Take Your Cat To Work Day” that you had a spiral staircase–what dizzying fun that must be to watch the cats running down t meals! Sparkle, we think you get fed separately from the rest or maybe it is Binga since she takes everyone’s food. So guess we don’t know who gets fed first. Take care everyone. Oh Sparkle… we just love your dry wit!! You are such a good kitty for shunning your food! 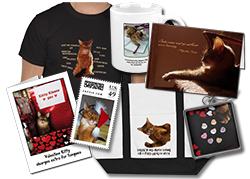 Concats on the Pettie nomination – we are so thrilled for you! Go zoomies on the stairs. Always fun! Congrats on being a Pettie Awards Finalist! I’d say Sparkle would be served first because of her lack of appetite? We say you first (after all, you rule and should get the prime selection) then Binga and Boodie. I’m thinking Binga, then Boodie, then you, when you finally make your entrance. Congrats on being a finalist. I say Binga, Boodie, and you wait till you see what it is they are serving. 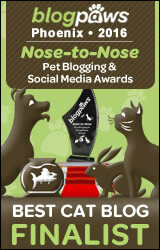 ConCATulations on being a finalist in the Petties! We are voting early and often for you! I love those stairs – although I am too clutzy to have them! Lucy on the other hand would have so much fun! Ready, set, go fur sure! I say Binga, Bodie then you!!! Boodie has to be in the kitchen first! We think Binga has to be fed first so she doesn’t get into everybody else’s food. Then Boodie, then you, Sparkle, so you can shun things. The head peep, in an early morning haze, tried to feed us in the wrong order the other morning and nearly had a riot. Keeping feeding time in order is important! Look at Boodie go! We think Boodie is served first & Binga is next in order to keep peace. Does Sparkle dine on top of a castle to get even further away?!? Happy Caturday! We hope your rushing to the kitchen is well rewarded with a delish dinner.